AirPods (2nd-generation): Should you upgrade? If you would like to remotely access files that are stored on your Mac, there are several ways to do it. But before doing so you will need a way to access your Mac from wherever you are on the Internet. There are a number of “dynamic DNS” services that can do this, but perhaps the most convenient (and arguably best) option is to use Apple’s Back to My Mac service. Create an Apple ID if you don’t have one. Enable the “Back to My Mac” service. You'll find the option for enabling Back to My Mac within the iCloud system preference. At this point, any Mac you have similarly configured with iCloud should be able to access the one you set up with Back to My Mac. Keep in mind that Back to My Mac requires that the remote Mac be connected to the Internet. Also, it should be configured to wake on demand so that when it’s asleep, it can act on a Back to My Mac request. To help ensure that this happens, launch System Preferences, choose the Energy Saver preference, and enable the Wake for Network Access option. Another issue you might run into is if your network has a firewall configured that prevents Back to My Mac access. If you can set up Back to My Mac but cannot seem to connect from a remote location, you might need to check your router's settings to ensure UPnP, or NAT-PMP services are enabled. In addition, check or reset your router's firewall (toggle it off, and test the connection), and also update your router's firmware to its latest version. It’s a good idea to test such a connection from a local coffee shop before needing to use Back to My Mac for mission critical work. When Back to My Mac is set up, you have several options for connecting to your remote Mac—opening programs and files directly on it, copying files to and from it, and controlling it remotely from the command line. Here’s how they shake out. The most intuitive way to access and manage your remote Mac is Screen Sharing, which streams the desktop view from your remote computer to the Mac you’re currently using. While the performance of this service depends on the speed of your broadband connection, you can use this to work as if you were sitting in front of your Mac. To enable Screen Sharing, go to the Sharing system preferences, enable the Screen Sharing service, and ensure that your user account is allowed access. By default only administrators are given access, but you can add specific users to the list or select the option to allow all users. When done, you can select your Mac in the Finder sidebar of another Mac configured with the same iCloud account and then click the option to share the remote Mac’s screen and open applications and documents on it. 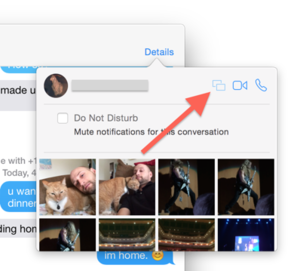 Enable Screen Sharing or File Sharing on your remote Mac and access it from another Mac's Finder window sidebar. Screen Sharing supports additional options such as synchronized clipboards and drag-and-drop support for file sharing. With these, you can drag files from the Finder in your current Mac to the screen sharing window to copy them to the remote computer. You can similarly copy files from your remote Mac. To use the shared clipboard option (enabled by selecting “User Shared Clipboard” in the Edit menu), copy any selected text or images on either Mac and the data will stream to the clipboard of the other. Then you can paste it by pressing Command-V. Messages allows you to share a friend's screen. If you wish to only access your remote Mac’s files and not deal with a potentially slow Screen Sharing experience you can do so by accessing your Mac’s files directly. Provided you have enabled the File Sharing service in the Sharing system preferences on your remote Mac, when you select that remote Mac in a Finder window’s sidebar on your current Mac, you will see the various default and custom shared folders appear, which you can mount and then navigate through to access the files you desire. Dive into Terminal to access a Mac with Remote Login enabled. Remote Macs with Screen Sharing and File Sharing enabled will appear in the Finder sidebar. If you enable only Remote Login, the remote Mac won’t appear. But you can access it via the Terminal app. To do this, launch Terminal (/Applications/Utilities), and then press Shift-Command-K (or select New Remote Connection from the Shell menu). This produces a New Remote Connection window. Within this window select the Secure Shell service and you should see any enabled Macs in the Server column. From here you can select and connect to these Macs to log into them. With this information, you can assemble the URL for directly accessing your remote Mac, provided you have the computer name for it (your Mac’s computer name is the name entered at the top of the Sharing system preferences). For these purposes, we are going to use the Bonjour name, which uses only lowercase letters, strips out all punctuation, and replaces spaces with dashes. So, for example, if I have “Topher’s MacBook Pro” as my computer name, then the bonjour name will be “tophers-macbook-pro” (we are leaving out the .local suffix here). As a final note, while sharing services have their conveniences, unless you use them regularly you might consider keeping them disabled. While there are no known hacks for these services, and they are built off of reputable and secure coding, best practices are to keep services off that you don’t intend to use.